The already established eatery has a new place to call home, where it successfully unites those age-old friends, burger and milkshake. Stokey Bears has had a nomadic existence until now, typical of the borough’s pop-up scene. Having passed through Nunhead, Old Street and, of course, Stoke Newington, the new permanent home for their loaded burgers and sides sits nestled in the parade of eateries at the Haggerston sector of Kingsland Road. One twist on the usual formula – far from the usual combative meat-first attitude, this branch of Stokey Bears has a full vegan menu of burgers – from veganised versions of notable favourites like the spice-laden Angry Bear and the Grizzly Bear (albeit with Karma Cola rather than bacon in the savoury jam) to bespoke options like the Koala bean burger. 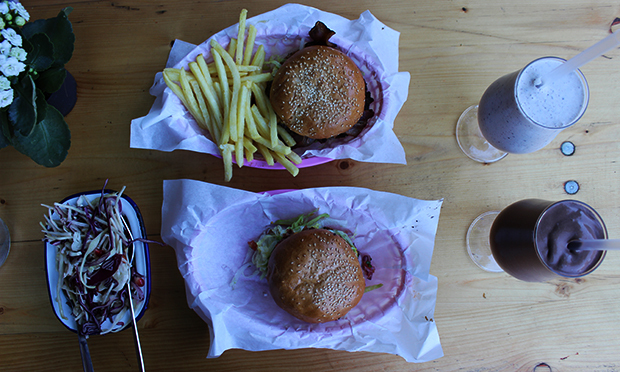 When the Citizen visited, this plant-based menu wasn’t quite up and running, but the carnivorous side of Stokey Bears was as reliable as ever – the burger patties moist but not too pliant; the duck fat fries smoky and crisp. The milkshakes, using made-in-Dalston vegan ice cream (although dairy ones are available courtesy of South London’s Ice Cream Union) are a perfect accompaniment, and there’s even a range of boozy ones to complement the local beers and wide cocktail selection. A modern interior (with full bar) is augmented with an almost pub-style garden overlooking the Overground. This is even kitted out with walls covered in chalkboard paint – on opening day, there were already kids gleefully scribbling. No doubt these images get a little more risque once the post-pub crowd come in for sustenance. Stokey Bears will be a name familiar to many in the borough already, but it seems this particular portion of Hackney’s street food smorgasboard will last for many dinnertimes to come.